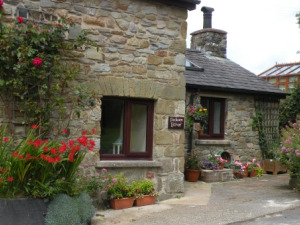 Fedwen Uchaf01239 811333work Self-cateringFedwen Uchaf at Tresaith is a beautifully renovated and centrally heated holiday home only a few minutes drive or a short walk from the very beautiful Tresaith Beach. The cottage sleeps 4 to 5 plus 1 cot with two spacious bedrooms upstairs, and an enormous lounge, newly fitted kitchen and bathroom downstairs. Weekly rentals start on Sundays from Easter to October half term, and from Saturdays from November until the end of March. Two small or one medium well behaved dog welcomed. Accommodation - The front door opens into the newly fitted and spacious kitchen, fully equipped with fridge/ freezer, electric oven with induction hob and extractor over, washing machine, dishwasher, microwave breakfast table seating two and all the crockery, glassware, cutlery, and cookware needed to cater for family meals and celebrations. There are 2 steps down into the large fully carpeted sitting room area, very comfortable new leather sofas and a 42" flat screen TV with Freesat. There is also a multi-fuel log burner ( fuel available locally ), a dining table and four chairs. Bedrooms - Upstairs there is a double bedroom, and a twin bedroom with a full sized cot - accessed by a galleried walkway. Bed linen is provided, but towels must be brought by guests. A fifth person can be accommodated in a folding Z-bed. An additional cot bed is also available. Bathroom - The fully tiled bathroom is downstairs and has a bath with electric shower over, WC, washbasin and large heated towel rail. Outside - There is ample parking in front of the property for one or more cars, plus space for bikes, a boat or water sports equipment. Behind the cottage, there is a patio area with seating and a charcoal BBQ, and a garden area beyond. •There is oil fired central heating with radiators throughout. Electricity & oil included within the rental. Fuel for the woodstove is available locally . No smoking inside the house. •Two small or one medium well behaved dogs welcomed. Pets are restricted to downstairs only - stair gate provided. •10% discount if only 2 are staying and using one bedroom only before May 27th or after August. •Full size cot available in twin bedroom, plus stair and door gates provided. •Full central heating with radiators throughout. •Weekly rentals start on Sundays from Easter to October half term, and from Saturdays from November until the end of March. •Adequate parking, space for boat etc. Tresaith - Tresaith is one of the locations most favoured by visitors to Ceredigion. It is almost a picture-book seaside village and offers a wonderful sandy beach, a beach shop that sells snacks, ice creams and beach toys - all good for children. There is also the toilet block with free shower opposite the shop. There are often events at the beach such as the Tresaith Mariners regatta and often there is a marquee on the beach with live music.